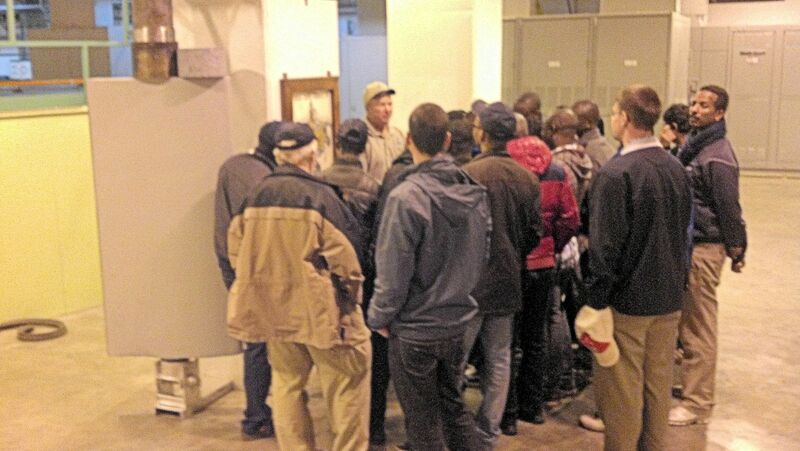 Central hosted 20 international students and four instructors for a recent tour of the hydro-irrigation project. The tour group was part of a field course coordinated by the United Nations Educational, Scientific and Cultural Organization’s Institute for Water Education (UNESCO-IHE) which is based in The Netherlands. UNESCO-IHE partners with the Daugherty Water for Food Institute at the University of Nebraska-Lincoln (DWFI/UNL), which in turn, partnered with Central to bring the students to Nebraska and to Central’s project area. The 14-day field course, coordinated by the DWFI/UNL faculty, is composed of two elements, field measurements and a field trip. 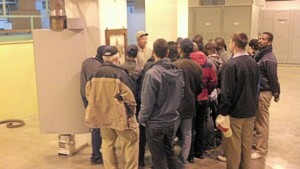 The field trip gives the students the opportunity to observe hydraulic engineering structures, irrigation schemes and structures, the manufacturing of water management equipment, including center pivots, PVC pipe, water meters, and vertical turbine pumps, and the installation of subsurface drip irrigation (SDI). Part of the tour group’s two days with Central included a stop at the Monsanto Water Utilization Learning Center near Gothenburg. The students also visited Central’s administrative headquarters in Holdrege; learned about Central’s Supervisory Control and Data Acquisition (SCADA) operations during a “virtual tour” of the control room; stopped at several sites within the irrigated area to see SDI and pivot sites and canal control structures; toured the Lake McConaughy Water Interpretive Center as well as the reservoir’s outlet structures and the Kingsley Hydroplant. The group stayed overnight at Jeffrey Lodge at Jeffrey Reservoir. Students are required to develop a report that accounts for the site visits. In the field measurements portion of the course, students collect and analyze data and write technical reports that include their synthesis and interpretation of the results and a summary of each project. Topics include efficiency and analysis of irrigation systems, groundwater and wells, discharge measurement in streams and pipelines, pumping systems for irrigation, pipeline hydraulics, soil water measurement, and soil hydraulic properties. The students at UNESCO-IHE are pursuing M.S. degrees in water science and engineering, specializing in land and water development. The students are experienced professionals from developing countries. This year’s class included students from Ethiopia, Ghana, Guyana, Indonesia, Kenya, Nepal, Nigeria, Pakistan, Swaziland, Tanzania and Zimbabwe. Since 1957 the Institute has provided graduate education to more than 14,500 water professionals from over 160 countries, the vast majority from the developing world. Numerous research and capacity development projects are carried out throughout the world. The Institute offers a unique combination of applied, scientific and participatory research in water engineering combined with natural sciences and management sciences. Since its establishment the Institute has played an instrumental role in developing the capacities of water sector organizations, not least by strengthening the efforts of other universities and research centers to increase the knowledge and skills of professionals working in the water sector. Laszlo Hayde and Sur Suryadi from IHE accompanied the tour group from the Netherlands. UNL faculty on the tour included Dean Eisenhauer and Derek Heeren. Central personnel who met with the students included Irrigation Division Manager Dave Ford, Kingsley Dam Foreman Nate Nielsen, and Gothenburg Division Manager Kevin Boyd. Public Relations Coordinator Jeff Buettner was the tour guide and host. Monte Vonasek of Central Valley Irrigation and John Ford, a producer and irrigation customer, also met with the group to share information about on-farm irrigation systems.